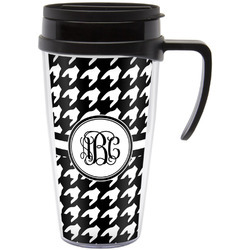 Our travel mug with handle perfect for anyone who is on the go all the time AND wants with to drink from super stylish personalized travel mug! 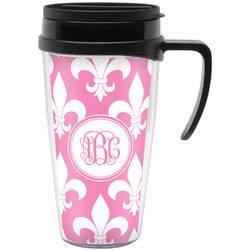 These 16 oz travel mugs are insulated to keep your beverage hot or cold. They have an easy snap on lid with a sippy slider to reduce spills and help maintain the temperature of your beverage.. For those of us who insist on handles on our mugs, this travel mug has a nice size handle. These travel mugs have a black lid and a black interior. The exterior is stylish and available in many different patterns, colors and designs.